After iPad Mini 2 Apple has dropped the ball once again with iPad Mini 3. The iPad Mini is quite identical to its predecessor, the only noteworthy feature is the Touch ID. The Touch ID does not work as brilliantly on an iPad as on our iPhones but it still makes it easier to use the device. Apple has excluded the NFC chip that it introduced on the iPhone 6/6plus and Apple watch. The NFC is limited to touch-to-pay and this device is too huge for it. The Apple iPad Mini 3 comes with the same screen as iPad Mini 2 with 2048 x 1536 pixels resolution. The tablet has a huge amount of detail for such a small display. It is perfect for watching movies and images even in bright sunlight. Unlike iPad Air 2, the screen is not bonded so it does not have the same anti-reflective layer or the same amount of vivid colours. It is packed with stereo speakers to enhance the movie watching experience. Overall, it is a decent tablet and the features are quite impressive but the price is a hitch. 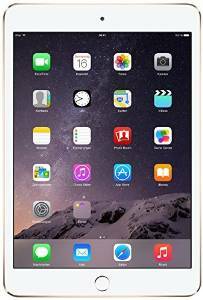 The apple iPad Mini 3 16GB is priced at INR 28900. Apple iPad Mini 3 WiFi 16GB full specs and reviews as of Apr 2019. Buy it here!